Ben King was born on December 9, 1919, in Add Lee, Oklahoma. He enlisted in the Aviation Cadet Program of the U.S. Army Air Forces on February 28, 1942, and was commissioned a 2d Lt and awarded his pilot wings on November 10, 1942, at Foster Field, Texas. After completing P-39 Airacobra transition training, Lt King served as a P-39 and then P-38 Lightning pilot with the 339th Fighter Squadron of the 347th Fighter Group on Guadalcanal and then Stirling Island in the Pacific from February 1943 to August 1944, during which time he was credited with the destruction of 3 enemy aircraft in aerial combat, all while flying P-38s. Also during this time, he was shot down on July 17, 1943, and evaded capture, returning to allied lines on September 17, 1943. His next assignment was as a P-51 Mustang pilot and as Operations Officer of the 368th Fighter Squadron of the 359th Fighter Group in England from August to December 1944, and during this time he was credited with the destruction of 4 more enemy aircraft in aerial combat, for a total of 7 destroyed during World War II. After the war ended, Maj King completed Command and General Staff School in February 1946, and served as a P-51 pilot and Commander of the 57th Fighter Group at Shemya, Alaska, from August to December 1946. His next assignment was as a P-51 and then F-80 Shooting Star pilot and Commander of the 65th Fighter Squadron at Elmendorf Field, Alaska, from December 1946 to May 1948, followed by service as Executive Officer of the 57th Fighter Group at Elmendorf Field from May to August 1948. He served as Commander of the 336th Fighter Squadron at Ladd AFB, Alaska and at Andrews AFB, Maryland, from September 1948 to June 1949, and as Operations Officer of the 336th Fighter Squadron when it moved to Langley AFB, Virginia, from July 1949 to January 1950. Lt Col King attended Air Command and Staff School at Maxwell AFB, Alabama, from January to June 1950, and then served as an F-80 pilot and Commander of the 41st Fighter-Interceptor Squadron at Johnson AB, Japan, from August to September 1950. His next assignment was as an F-80 pilot, Executive Officer, and then Commander of the 8th Fighter-Bomber Squadron at Taegu AB, South Korea, from October 1950 to April 1951, followed by service on the staff of 5th Air Force at Taegu AB from April to July 1951. Lt Col King served as Commander of the 121st Fighter Interceptor Squadron at Andrews AFB from July 1951 to November 1952, and then as Operations Officer for the 4710th Air Defense Wing at New Castle City Airport in Wilmington, Delaware, from January to August 1953. His next assignment was as Commander of the 525th Air Defense Group at New Castle Airport from August 1953 to August 1955, followed by service as Commander of the 82nd Fighter Group at New Castle Airport from August to October 1955. Col King served as Deputy Commander for Operations of the Iceland Air Defense Force at Keflavik Airport, Iceland, from October to December 1955, and then as Commander of the 1400th Operations Group at Keflavik from December 1955 to January 1957. His next assignment was as Commander of the 4750th Air Defense Group at Vincent AFB, Arizona, from January 1957 to September 1958, followed by service as Commander of the 4750th Air Defense Wing at Vincent AFB, and then at MacDill AFB, Florida, from October 1958 to June 1960. Gen King next served as Director of the Joint Bomarc Test Staff with Detachment 1 of the Montgomery Air Defense Sector at Eglin AFB, Florida, from July 1960 to May 1961, and then as Commander of the 4400th Combat Crew Training Squadron and then 4400th Combat Crew Training Group at Hurlburt Field, Florida, from May 1961 to March 1962. He served as Commander of the 1st Combat Applications Group at Eglin AFB from April 1962 to October 1963, and then as Deputy Director of the Office of the Secretary of Defense Advisary Research Project Agency Field Unit in Bangkok, Thailand, from October 1963 to October 1964, during which time he flew 100 combat missions in Southeast Asia. His next assignment was as Vice Commander of the Los Angeles Air Defense Sector at Norton AFB, California, as Deputy for Operations of the 28th Air Division at for 4th Air Force, and as Vice Commander of 4th Air Force at Hamilton AFB, California, from October 1964 to August 1967. 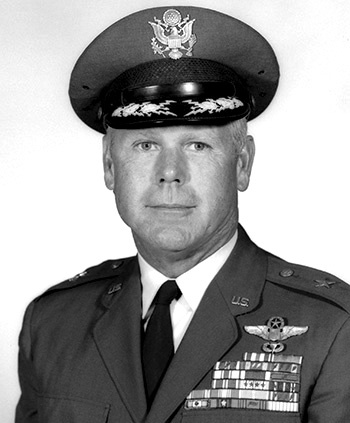 Brig Gen King served as Inspector General with Headquarters Aerospace Defense Command at Ent AFB, Colorado, from August 1967 to January 1969, followed by service as Director of Aerospace Safety in the Office of the Deputy Inspector General for Inspection and Safety at Norton AFB from January 1969 until his retirement from the Air Force on February 1, 1971. Ben King died on October 5, 2004. For gallantry in action over Eisleben, Germany, while flying a P-51 fighter, 11 September 1944. Major King was escorting heavy bombers to their target when more than fifty (50) enemy fighters made a determined interception attack. Observing approximately fifteen (15) fighters attacking the rear echelon of bombers, Major King, supported only by his wingman, went to their assistance. Ignoring the enemy's advantage in strength, he successfully destroyed two planes. He then chased a FW-190 down to tree top altitude, expended the last of his ammunition as the aircraft hit the ground and exploded. Now flying alone and without ammunition, he got on the tail of another enemy plane and gallantly made an unsuccessful attempt to drive him into the ground. The outstanding courage and superior combat skill displayed by Major King during this action were an inspiration to his fellow pilots.